Fall is for travel — and here we go again! | Oh, the Places We See . . .
With all good intentions, we wanted to write extensive blog posts commending the National Park Service and God for creating glorious parks around incredible natural scenery. But fall is for travel, and we’re finding we’re not adept at posting while on the road. And we’re not off the road long enough to post. This fall, we saw Utah. Well, not all of Utah. But some pretty spectacular parts of it — from Salt Lake City to Arches, Canyonlands, Capitol Reef, Escalante, and Bryce. And points in between, of course. We were awed by the beauty, as any of you who have visited these sites already know. But we don’t have time to post because we’ve book a Viking River Cruise from Paris to Normandy and then an extension to London, the Cotswolds, and some of the sites I told my high school students about but I’ve never seen myself: the Globe Theatre, Stonehenge, Stratford, Oxford, Bath, and more. So, here’s the best we can do ’til we return. We’re posting links to some of our Utah pictures on Flickr taken at Canyonlands. Just know that we have pics of other parks that we’ll be sharing later. We’re glad the 100-year celebration of the National Park Service uses this hashtag — #FindYourPark — because we’ve found not one but many. Best wishes for great viewing! There’s more to come. We promise. In the meantime, Happy Thanksgiving, Merry Christmas, and best wishes for a great holiday season at home or abroad! 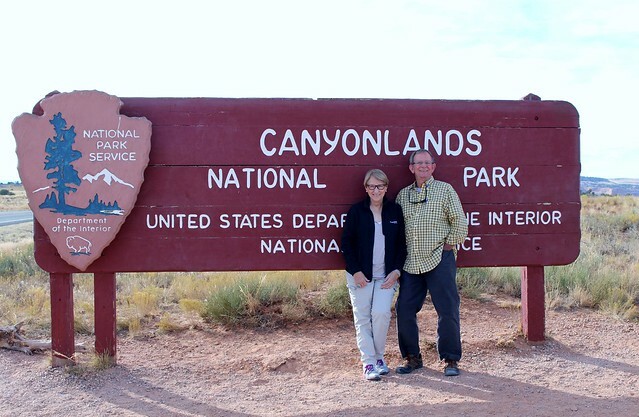 This entry was posted in Boomer Travel, Photography, Travel, Utah, We Saw Utah! and tagged #FindYourPark, arches, Bryce, Canyonlands, Capitol Reef, National Park Service. Bookmark the permalink. 33 Responses to Fall is for travel — and here we go again! Thanks! I’ve got hundreds, and at some point, I’ll get to writing about Utah. Appreciate your comment! Great photo’s and narration. Please keep sharing the world through your eyes and words. Thanks so much. We had a big year of travel last year, so we’re hoping to share some of our pictures on the blog. We can’t wait to see them and hear your stories. You are so welcome, Wendy. And thanks for joining us in Utah!!! Lovely place, thanks for sharing! Following, for more national parks pictures! Enjoy traveling! So glad you are following us. We love to travel — on a budget — but we love everything we see. Can be a problem, of course. We have to take time to write, too! But your comments mean a lot. Best wishes for good holidays. Thanks for understanding. If this were a job, I’d tote that laptop with me and stay up ’til midnight writing. But since it’s not, we try to have fun while traveling and then write when we get home. Of course, there are drawbacks — sometimes I can’t remember the names of towns, castles, etc. Thanks heavens for the Internet!!!! Best wishes for good holidays. Looking forward to your posts on your latest adventures. This is just gorgeous, love the photos! And the colours are just amazing. Hope I get to visit some of these places – I especially like the photo from Arches National Park. It is just amazing to think about how this can exist! Thanks for your lovely comments. We absolutely loved our time in Utah this fall, and we’d both love a return trip — a slower-paced one, for sure. If you like taking pictures, head to any of the parks — they’re paradises for shutterbugs. Stumbled upon your great blog. We just got back from Utah as well (southern Utah) and were in total awe. It’s an amazing state. Super national park photos! I saw on your comments on Gallivance that you want to go to Alaska. Feel free to contact us if (when?) you decide to make the trip, as that is where we are from, and might be able to steer you to some good places. We currently live there half the year and in Oaxaca, Mexico the other half. Wow! We’d love to know more about Alaska. Hopefully, we can get there this year or next. We’re not getting any younger, so I really want to see what we can while we can. Thanks for taking a look at Utah and mentioning where you live — both great places! Wow! Stunning. Who knew Utah was so dramatic? Not me….. Thanks! We loved France and England — not one over the other. But I may have to stop these whirlwind tours — I need a bit more time to linger! Whew! Best wishes for happy holidays! Gorgeous!!! Pictures of these places always make me want to go back!! Thanks so much! Had a great time stopping and snapping! We live in a gorgeous world. Have a great time, Rusha and Bert! Bill and I went to Stonehenge, Stratford and London in 1971 with an intensive study group from college – still have memories of that trip today! Can’t wait to see your photos of Paris – on my bucket list! It’s hard to believe that it’s taken us this long to get to these places. So glad we can still travel and take it all in. Hoping for good (well, decent) weather and pretty Christmas displays! Thanks for all the great ideas of what/where to visit! We promise to post more when we stay home this winter! Thanks for following. And may all your holidays be wonderful!